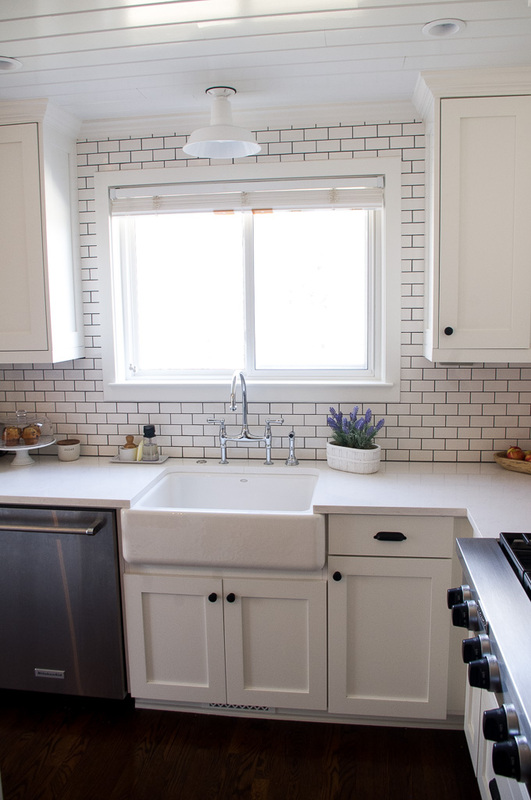 Here’s a little bit about our kitchen renovation before I jump into the sink review. We started our renovation back in 2015 and did a lot of the work ourselves and hired out the aspects we knew we wouldn’t be able to do ourselves. At that time we had a 2 1/2-year-old and a 1-year-old, so things were crazy, to say the least. We lived in our living room for a year and a half (which was fun 🤪) and did all the cooking and washing in our half bath. By the time we got the farmhouse sink installed, I was so used to washing everything in the tiny bathroom sink that it seemed huge, but I was so happy. 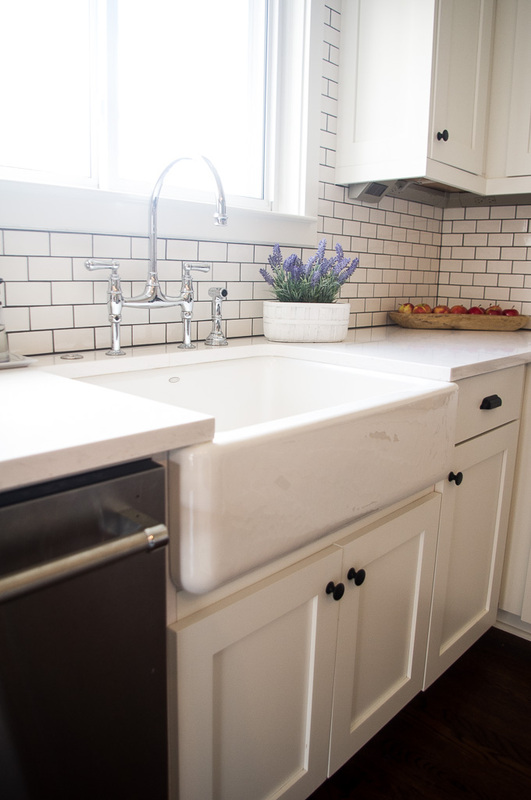 Why We Chose a Farmhouse Sink? I love the look of an apron-front sink. It is a classic and timeless design that gives the farmhouse feel. We chose this style of a sink because it matched the design we were hoping for the kitchen, but also for space as it can hold a lot of dishes and makes cleaning large pots, pans and sheet tray really easy. 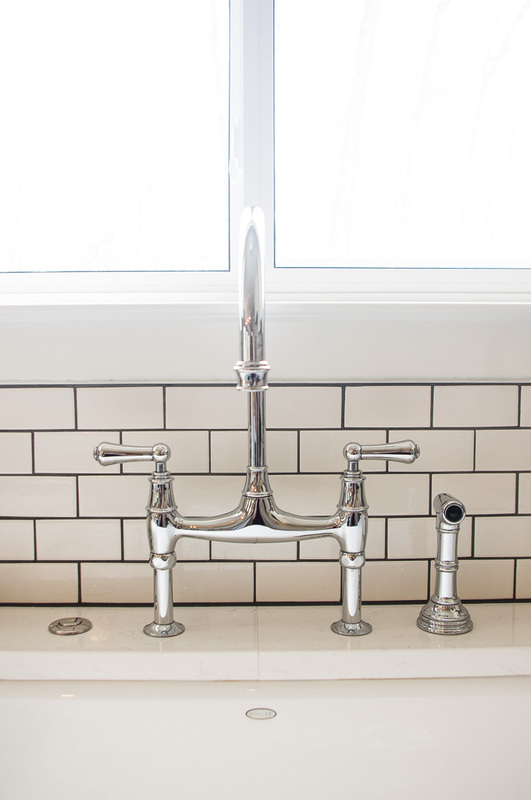 There are three materials for apron-front sinks: stainless steel, fireclay, and cast iron. Stainless steel sinks are very durable and non-porous, which makes them great for cleaning and disinfecting. They are also resistant to heat, rust, corrosion, and stains with proper care. Fireclay sinks are made of clay and glaze that are heated to an extremely high temperature which causes them to fuse together to create a very durable ceramic material. They are non-porous and resistant to scratching and relatively chip resistant. However, they can crack or chip over time and are not “friendly” when a dish gets dropped. Cast iron sinks are made of just that, cast iron, but with an added porcelain enamel on top. They are also heated to a very high temperature which creates a smooth and shiny surface. They are crack and dent resistant but are susceptible to staining if not cared for properly. The porcelain enamel can chip or scratch over time as well if not treated carefully. Which Sink Did We Choose? We have a Kohler Whitehaven self-trimming apron-front sink. We decided to buy this sink because it fit within our price range, has good reviews and worked with the cabinets we were buying. It is enameled cast-iron and resists chipping, cracking, or burning. I will say that I have dropped a couple knives and a large pot and there are no chips or cracks, so that’s good. I recommend using a wire-rack set in the sink to protect the surface as much as possible. The wire rack also helps with water sitting directly on the surface of the sink. I love ours! Just to clear up some confusion about whether enameled cast iron sinks rust. Kohler sinks are made of enameled cast iron NOT enameled steel. The difference is the material under the enamel. 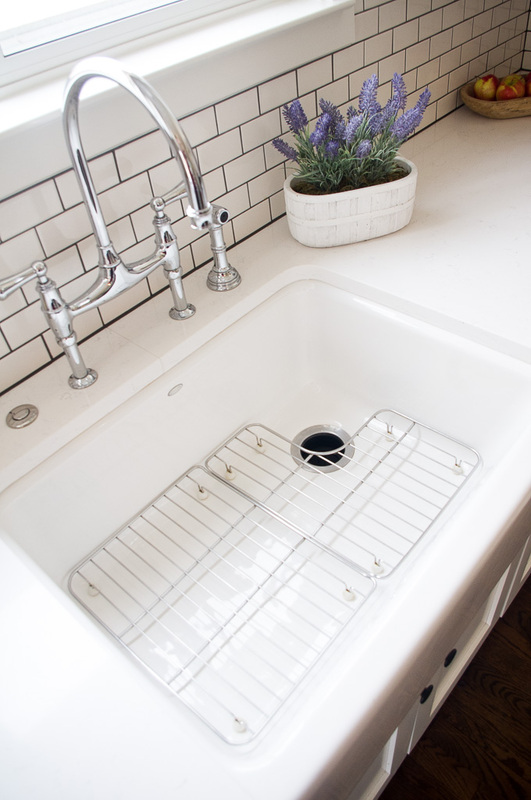 The enameled steel sinks are more flexible and therefore more prone to dents and scratches and then rusting. No rusting here! Like I said Kohler sinks are made of enameled cast iron and are built to last, they even give their sinks a lifetime warranty! While we’re talking about farmhouse sinks, I think that the faucet is the next shining star in a kitchen. I knew that I wanted a high arc faucet with lots of farmhouse charm. This faucet was one of the most expensive items that I bought for our kitchen renovation and I LOVE it! It is a Rohl Perrin and Rowe bridge faucet with side spray in polished chrome. It is the jewelry in my kitchen. 💕 I was not sure about getting the side spray, but am so happy I got one because it helps get the sink super clean and get all the extra food down the drain. Overall I LOVE our farmhouse sink! I wouldn’t change making this choice in a million years and when we move I hope to have another one at some point. 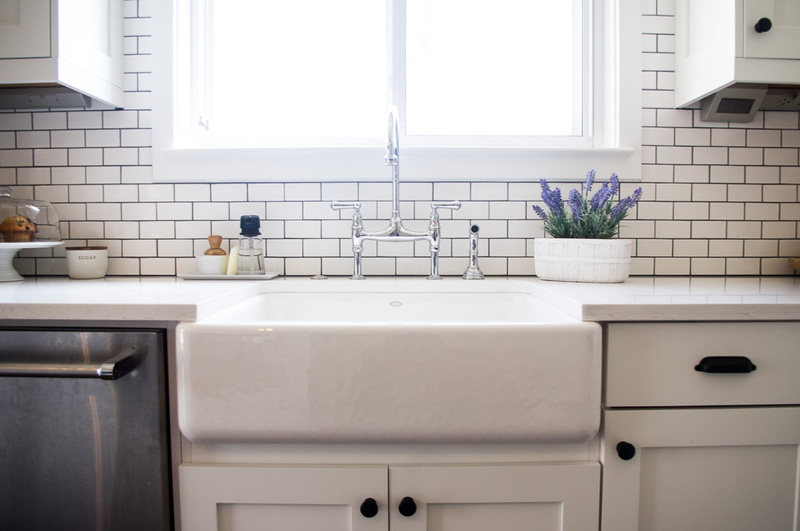 ☺ Apron-front sinks are timeless and add some farmhouse charm to the kitchen. They are more expensive than other sinks but it is totally worth it. 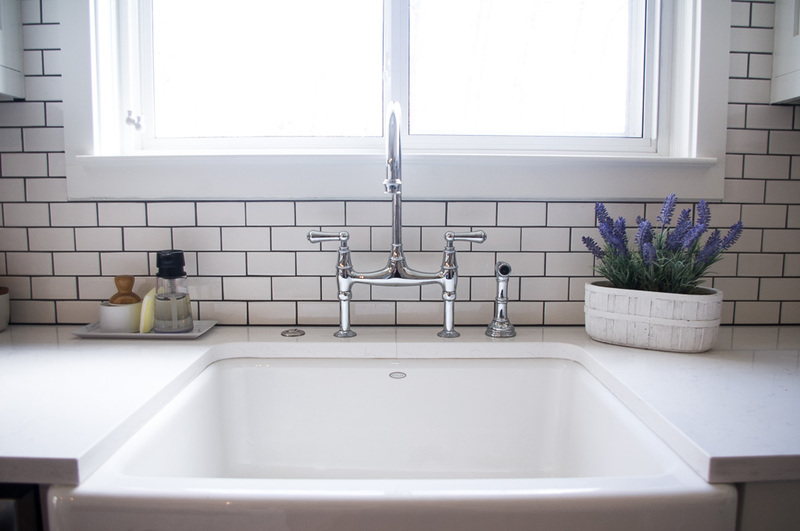 I hope this farmhouse sink review helps you decide which sink is the best fit for you. Let me know if you have any questions and I’ll be more than happy to help the best I can.